Located on the face of numerous indicators allow its owner to be aware of the current time, altitude, range and weather forecasts on their own barometer. The hours and minutes are displayed on the sub-dial translucent smoked sapphire glass on top of a general indicator of the dial with a small second at 12 o’clock position. A scale that display the high curved arch above the upper perimeter of the dial. Barometer by which to measure the pressure is available at the label 2. Index 65-hour power reserve is in the “4:00”, the label is located 6 capsule, which measures atmospheric pressure, and next to it – the other capsule, to enhance the sensitivity to small changes in pressure. Genie Model 01 has three crown with dual functions. Located in the “9:00” head is designed for the plant and set the time. Place in the position of “2:00” pan-head is used to set the scale of the barometer, and its internal button – to set the position of the altimeter. Another crown is at the label 4. It is equipped with a ring that is rotated by 90 °, to open or close the pneumatic valve. Valve in the open position allows some air pressure inside the agreed hours of external atmospheric pressure. Reliability provides hours osmotic membrane filter water from the air before it gets inside the gauge. Above the crown has a special red light with the words «SEALED». Protects original dial sapphire crystal, also set on the back cover, through which you can observe the work of fire. When the factory outlet mechanism rotate compass, located on top of the main coil springs? 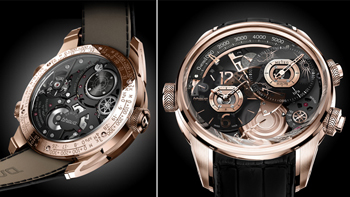 The original watch Genie 01 limited edition – 55 copies in white gold and 55 copies, made of pink gold.